This blog, though, is sober — deadly serious, in fact. Two days ago, the kindness of a stranger may have saved my son Ben’s life. The stranger’s kindness has filled my family with gratitude (a key happiness tool) and has spared us from immeasurable pain. 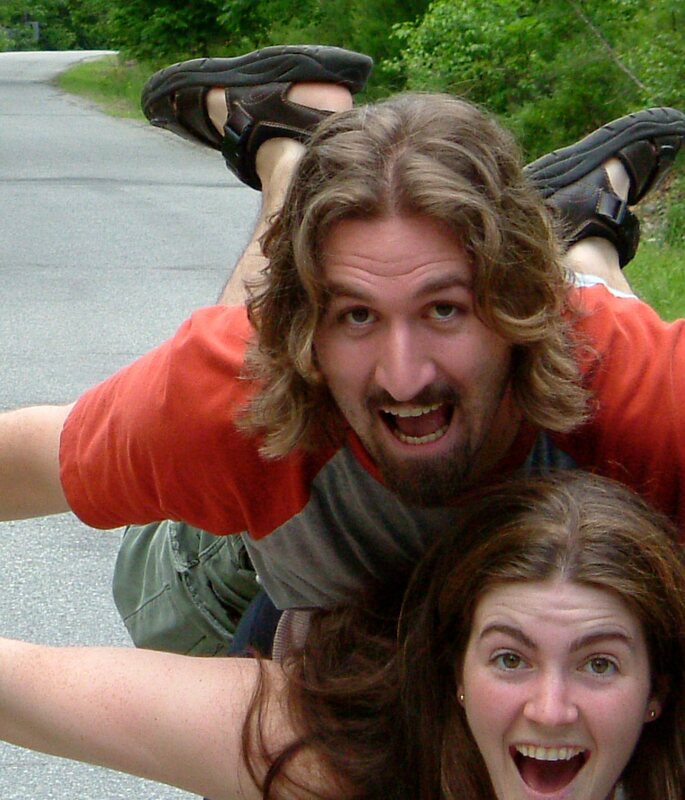 We don’t know who he is, and he will never know how profoundly he helped Ben — but his actions illustrate how interconnected our lives are, and how our choices can impact the happiness of others. 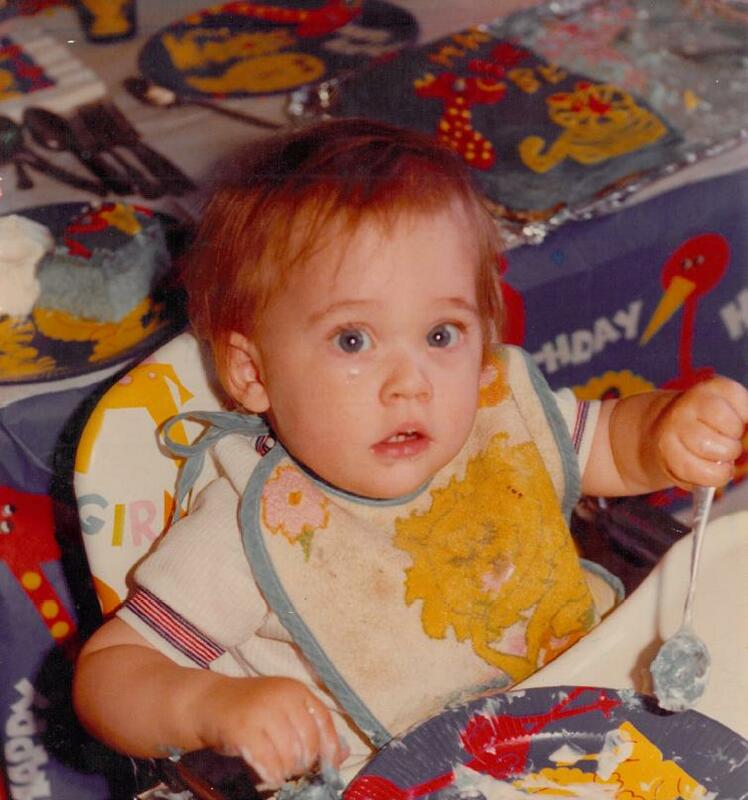 Ben on his first birthday, 38 years ago this month. He’s still pretty cute, though. Thanks to another gift — a very, very small inheritance check from his grandfather — Ben bought a new-to-him pick-up truck from a dealer in Vermont’s Northeast Kingdom, about an hour and a half away. I drove him to pick up the truck. We decided not to convoy on the return trip, as he needed to stop for gas. Also, he observed, I had my cell phone so he could always call if for some reason he needed help. Or not. In this part of rural Vermont, cell coverage is highly sketchy. Did I mention the tornado warnings? Right before we left home, I learned from The Weather Channel that our entire area was under a tornado watch. And as we drove north, I kept the radio on, just in case the dreaded emergency broadcast signal began. It did, with warnings of a severe thunderstorm headed toward in the same direction as we were. So when we left the dealership, I was eager to skedaddle south as quickly as possible — radio still on, with more warnings. Tornadoes, this time, in the towns I had just driven through. I quickly calculated that, even stopping for gas, Ben was probably through those towns, too. All was well. At home, I breathed a sigh of relief and then looked at my cell phone. Ben had called twice. Not good. Not good at all. Anxiously, I called back. He was stressed, though alright. He, too, had been trying to drive out of the tornado zone — but ran out of gas and was stranded along the interstate, in the bull’s eye of the oncoming storm. Minutes before it hit, the stranger picked up my son and dropped him off at a gas station in town. The tornado touched down nearby, taking out hundreds of trees and one chimney — but, as it turned out, that wasn’t the real danger. Okay, that’s all my mother’s heart can bear to write. I’m reminded of the Dalai Lama‘s wisdom that, in every interaction with every person, we can either contribute to that person’s happiness or contribute to that person’s unhappiness. Usually I interpret that as sharing smiles, pleasant greetings, or maybe a hug. Not, saving someone’s life. I’m reminded, too, of an incident many years ago when Ben may well have saved the life of another stranger. It was a cold November evening and Ben was outside having a cigarette (that’s another story!). From somewhere in the woods at a bit of a distance from our house, he heard — or thought he heard — a very faint cry for help. Together with his dad, Ben took off running toward the voice, which belonged to a hunter who had fallen from a tree and broken his leg. The hunter was alone and unprotected. The night was about to turn freezing. Thanks to Ben, emergency personnel got the hunter to safety. None of us know who that man was, either. I have on my bookshelf Exploring Happiness: From Aristotle to Brain Science, a review of morality and happiness by the very thoughtful Sissela Bok. I have thought about the concept of morality of happiness from the viewpoint that our happiness choices might have a negative effect on others — ie, drinking non-fair trade coffee could lead to suffering and exploitation of those who pick the beans in countries far from me. But the truck incident has turned my thinking around. Our moral choices, decisions made from kindness or a generosity of spirit — say, picking up a driver stranded by the side of the road — could well enhance the happiness of others far beyond our knowing. “So I say: THANK YOU with all my heart to the man who potentially saved my brother’s life yesterday by being generous and giving him a ride. Indeed. Sometimes we need a kind stranger, sometimes we’re called upon to be that kind stranger. Happiness may depend on how, or whether, we answer that call. * The other driver was uninjured, and Ben’s truck was insured.